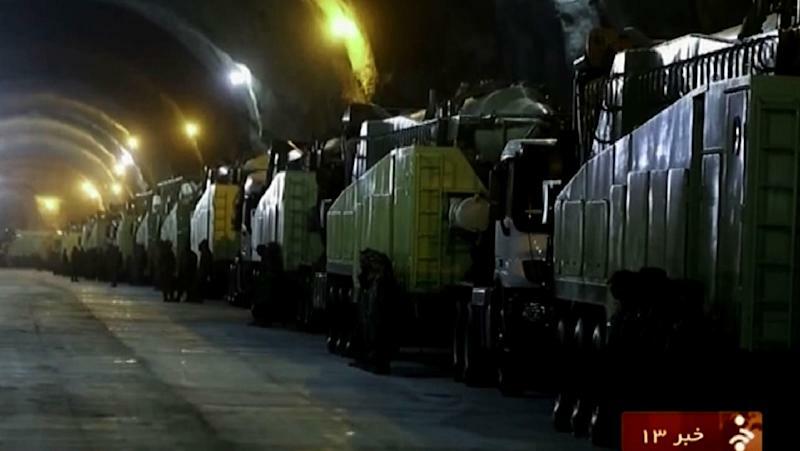 Tehran (AFP) - Iranian state television broadcast unprecedented footage Wednesday of a deep underground tunnel packed with missiles and launcher units, which officials said could be used if "enemies make a mistake". The pictures were released just three days after Iran tested a new long-range missile that the United States said may have breached a UN Security Council resolution. The footage also came a day after Iran's parliament approved the country's July 14 nuclear deal with six world powers. Iranian officials have said the nuclear agreement will not affect its military forces, particularly its ballistic missile programme. The missile launch and underground footage followed pressure from lawmakers to prove the military had not been weakened by the deal. The tunnel, hundreds of metres (yards) long and about 10 metres high, was filled with missiles and hardware. Brigadier General Amir Ali Hajizadeh, commander of the Islamic Republic's Revolutionary Guards' aerospace division, said numerous such tunnels exist across the country at a depth of 500 metres. "The Islamic republic's long-range missile bases are stationed and ready under the high mountains in all the country’s provinces and cities," he said, according to the Guards' website. The commander said the missiles were ready to be launched from all over Iran, on the order of "the supreme commander-in-chief", Ayatollah Ali Khamenei. “This is a sample of our massive missile bases," he said, adding that "a new and advanced generation of long-range liquid and solid fuel missiles" would start to replace the current weapons next year. The commander seemed to suggest the show of strength was in response to Western powers, especially the US, which despite the nuclear deal, have said options against Iran, including the military one, remain on the table. "Those who pin hope on options on the table, should only have a look at the Islamic republic's army options under the table." Hajizadeh said Iran would not start any war but "if enemies make a mistake, missile bases will erupt like a volcano from the depth of earth". The US on Tuesday said Tehran may have breached a Security Council resolution during Sunday's test of the new Imad missile. White House spokesman Josh Earnest said there were "strong indications" that Tehran "did violate UN Security Council resolutions that pertain to Iran's ballistic missile activities". Under a resolution passed days after the nuclear deal was reached, Iran was barred by the Security Council from developing missiles "designed to carry nuclear warheads". However the White House insisted the launch would have no impact on the nuclear agreement which is due to be formally implemented by the end of this year.